While Death Valley is the largest national park in the United States, it's definitely not the most popular. The fact that it's a desert (and often scorching hot), as its name suggests, probably plays into its lack of popularity. If you get a chance to visit though, Death Valley is a fascinating and highly unique place and people are starting to get on board with that fact, as evidenced by a 12% increase in visitors between 2015 to 2016, with 2016 welcoming a not too shabby 1.3 million visitors. A few years ago Justin and I got the chance to visit for a single day, so I've created a sample one day itinerary below with the sites we chose to visit. Obviously there are loads of other interesting things to see in the park that we simply did not get a chance to get to, with some of the more notable ones being Zabriskie Point, Dante's View, Devil's Golf Course, and the Race Track. Out of all of those I think I would have liked to see the Race Track the most, but it's an approximately 3.5 hour drive from Furnace Creek and a high clearance 4x4 vehicle is recommended, so definitely wasn't in the cards for us on a one day visit. The map below shows most of the places we visited so you can get a sense of the layout. We entered and exited the park at Panamint Springs. This map from the National Park Service displays the whole park and allows you to zoom to get all the details. Spring is usually considered the best time of year to visit with warm sunny days that aren't too hot and the possibility of wildflowers, which usually peak late March to early April. Autumn (when we visited) starts in late October and is also a good time to visit the park with pleasant temperatures and less people. 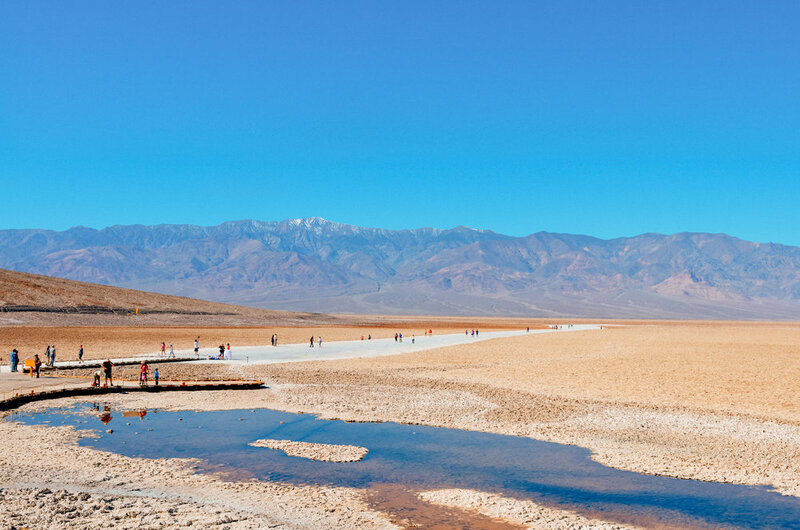 Death Valley is famous for its extreme heat, so although visitors continue to flock to the park during the summer months, its probably the worst time of year to visit. Summer temps often exceed 120F (49C) in the shade and remain 90F+ (32C+) at night. In fact, a world record high air temperature of 135F (57C) was recorded in Death Valley near Furnace Creek in 1913. 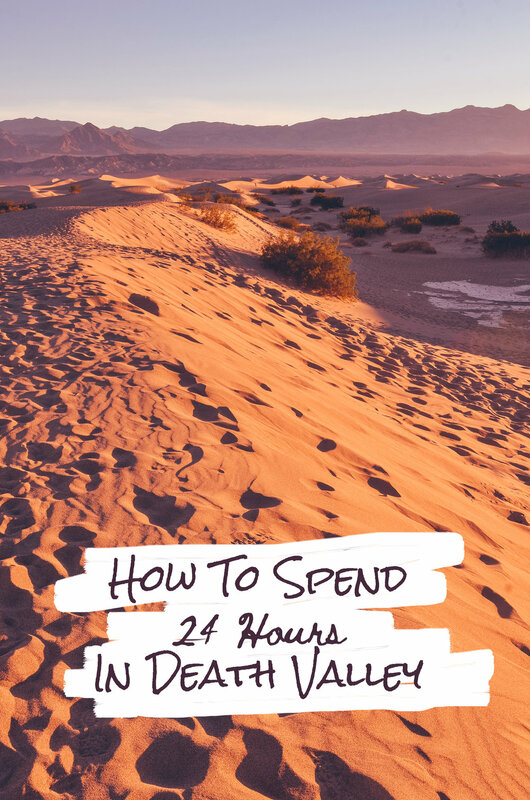 If you arrive in the park in the evening like we did, or early in the morning, start your first day by visiting the Mesquite Flat Dunes, a massive area of sand dunes fringed by mountains. They start right beside the main road so are super easy to access. Some of the dunes reach up to 100 feet (30 meters) and are the only dunes in the park that allow sand boarding. We didn't know that when we visited otherwise we would have loved to give it a go! I'm pretty sure you have to bring your own gear though. I wonder how well sand skiing would work? At any rate, watching the sun rise (or set) over the dunes is pretty magical. If you have a bike, cycling to one of Death Valley's most iconic sites, Badwater Basin, makes for a fabulous ride as long as you don't do it during the wrong time of day in the summer when temps can soar to triple digits. A boardwalk and trail take guests through and around the basin's vast salt flat and saline ponds. I rode the 15 miles (24 kilometers) from Furnace Creek to Badwater Basin and it was a very fun ride with lots of hills. I thought the whole thing was going to basically be downhill, but there were actually quite a few hill climbs followed by a very satisfying long descent to the valley floor to finish things off. And don't worry, even though the photo below may suggest otherwise, I was wearing my helmet the whole time. Badwater Basin is the lowest point in North America at 282 feet (86 meters) below sea level. Ironically, the highest point in the contiguous United States, Mt. Whitney, is just 84.6 miles (136 kilometers) away. A very popular attraction in Death Valley is a windy 9 mile scenic loop called Artist's Drive. The most interesting part of the drive, in my opinion, is an area called Artist's Palette, so named for the pink, purple, red, green, white, and yellow rocks and sand that streak the surrounding hills. The colors are created by the oxidation of different metals present in the rocks and soil. For example, iron compounds form the pink, red, and yellow colors while manganese creates the purple tones. My parents took my sister and I to Death Valley when we were little and the most memorable moment for me was filling a small glass jar with layers of different colored sand from the Artist's Palette area. Keep in mind that vehicles longer than 25 feet (7.6 meters) are not allowed on Artist's Drive. When borax was discovered near Furnace Creek in 1881, a man named William Coleman built a plant called Harmony Borax Works to process ore and produce borax. During full operation the plant employed 40 men and produced three tons of borax a day. However, getting the borax out of Death Valley to the nearest railroad station was very difficult and required double wagons and massive mule trains to undergo a 330 mile (531 kilometer) round trip journey. In order to boost sales of borax, often used at that time as a laundry product, a member of the company named Steven Mather decided to romanticize the image of the borax industry. He got a reporter to create a book called Illustrated Sketches of Death Valley that contained images of mule teams pulling wagons and then convinced the company to make the "20-mule team" their corporate logo. He then sent two wagons and a mule team to the 1904 St. Louis Exposition where it was put on display with a man called "Borax Bill" who pretended to be a mule team driver, dazzling audiences with his dramatic renditions of borax being hauled from Death Valley. The exhibit was so popular that it went on the road for several years touring various cities. The romanticized image of the "20-mule team" persists to this day as the symbol of the borax industry. Visitors can now stop at the old site of Harmony Borax Works where an interpretive trail leads through what remains. We like history so we found the whole thing quite interesting. If you're going to do a hike in Death Valley, Mosaic Canyon is a lovely one located a quarter mile from Stovepipe Wells. The drive to the trailhead is uphill on a gravel road, but having an all wheel drive vehicle is not necessary as is the case in other areas of the park. The road ends at the foot of the canyon where the hike begins and boasts a sweeping view of the valley below. In the distance one can even see the Mesquite Flat Dunes. Mosaic Canyon is comprised of two parts: the upper and lower canyon. The lower canyon is the narrower with a slot like vibe and smooth marble walls inlaid with various kinds of rock, thus the name Mosaic Canyon. Both the photos below were taken in the lower canyon, which is only about a quarter mile (o.4 kilometers) in length. The upper canyon is wider with high steep walls and culminates in a dry waterfall (well, almost always dry) that is a popular place to climb. The whole thing makes for a pretty easy and level hike with some very interesting geology. Emigrant Campground is one of several free campgrounds in Death Valley. Located at the edge of the park, Emigrant Campground makes for a handy first stop or place to spend the night if you're entering or departing through Panamint Springs. There are just 10 tent only camp sites located in a flat gravely area immediately off the freeway, so don't expect amenities to be too luxurious. However, there are picnic tables and restroom facilities nearby with flush toilets, which surprised us. We spent the evening reading and playing games and watching a pretty incredible sunset. Being far from any cities or towns, Death Valley has very little light pollution and therefore is an incredible place to stargaze/try out your night photography skills. Since Mesquite Flat Dunes are pretty close to Emigrant Campground, we drove back to them around 8pm and hiked out into the dunes with tripod and camera in tow. Sitting at the top of a dune looking up at Milky Way was the most magical moment for me in an already magical day. We tried our best to capture the stars, but having never done night photography before our attempts weren't terribly successful. 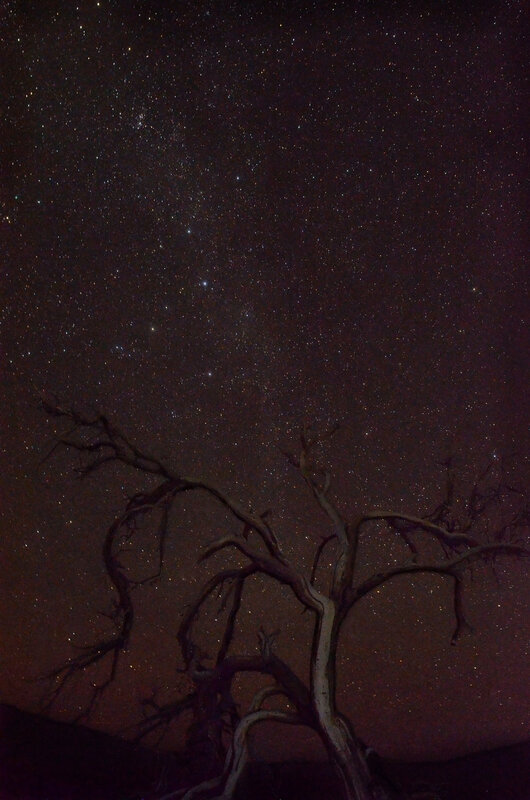 I've included a couple of photos anyways to give you a taste of what the night sky in Death Valley looks like.